Imagine your living room with no Chairs, Tables, Computers, etc and only atoms, molecules, proteins, and cells. This is what nanotechnology is capable of. With Nanotechnology, you can build all kind of fantastic stuffs, everything from brand new medicines to ultra-fast Computer chips. “Making new things on this incredibly small scale is called as nanotechnology”. This is one of the most exciting and fast moving areas of Science and Technology today. Integrating silicon nano-photonics components into CMOS integrated circuits. This optional technique is intended to provide higher speed data transmission between integrated circuits than is possible with electrical signals. This will help mobile technology to get more faster with less space. Using quantum dots to replace the fluorescent dots used in current displays. Displays using quantum dots should be simpler to make than current displays as well as use less power. Using Nano sized magnetic rings to make Magneto resistive Random Access Memory (MRAM), which research has indicated may allow memory density of 400 GB per square inch. Using Magnetic quantum dots in spintronic semiconductor devices. Spintronics devices are expected to be significantly higher density and lower power consumption because they measure the spin of electronics to determine a 1 or 0, rather than measuring groups of electronics as done in current semiconductor devices. 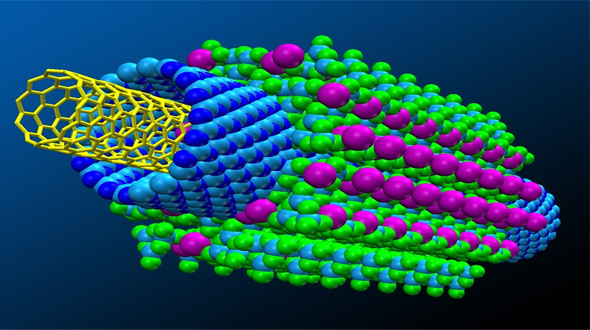 Using nano wires made of alloy of iron and nickel to create dense memory devices. By applying current magnetized sections along the length of the wire. As the magnetized sections move along with wire, the data is read by a stationary sensor. This method is called Race track memory.